Percy Jackson: Sea of Monsters; Thor Freudenthal is the director of this mystical and fantasy film, he presents us a movie where the characters in order to restore their dying safe haven, the son of Poseidon played by Logan Lerman as Percy Jackson and his friends, one of them is Alexandra Daddario as Annabeth who is embark on a quest to the Sea of Monsters to find the mythical Golden Fleece while trying to stop an ancient evil from rising. The central point of this movie is believe in your dreams and do what you need to do in order to make it come true. Friendship plays a important part in this movie; trust in your friends, enjoy the daily journey and you can chance your destiny. 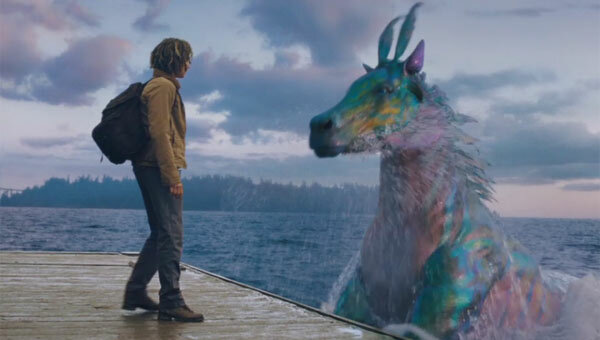 In the Film Thor Freudenthal introduce some characters are the half-human, half Olympian son of Poseidon has its many perks, from high-stakes adventure to encounters with fantastical creatures to living with your demigod pals at what is basically the world's coolest summer camp. But gods tend to be remote parental figures and being a hero comes with its own new insecurities. Percy now faces an unusual problem, unsure of himself and seriously considering the possibility that he is a one-hero wonder. Athena's spunky daughter is played by Alexandra Daddario and a wisecracking satyr Brandon T. Jackson lend a hand on the desultory goose chase, which takes them everywhere from the depths of the ocean to Circe's magical island to Washington D.C., of all places. Is a good movie with a great effects, makes the movie the spectator to go in this magical film end enjoy the movie. There are plenty of artfully designed CGI monsters to make kids go yikes! (a flame-spitting mechanical bull), aww! (a cuddly sea horse), and eww! (the innards of an ocean beast), but the formulaic story won’t get more than a meh from anyone. The movie's action sequences and cutesy comic bits (best of which is Nathan Fillion's cameo as an all-business Hermes, running a UPS-style empire) arrive at stopwatch-regular intervals, as do the unsubtle moments when Percy learns important lessons — about trusting his friends and deciding his own fate — usually by stating them aloud like a schoolkid reciting spelling words. But what really separates Percy (based on the book series by Rick Riordan) from Potter is the vein of snark running through its characters. All the friends and Percy complete their quest the movie ends where they gave back life to a Thalia a rol played by Paloma Kwitkowski. Using the Magical and mythical Golden Fleece.